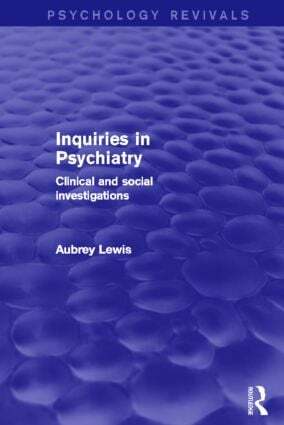 Originally published in 1967 this volume reports the outcome of research in a variety of fields. Of the numerous clinical investigations, those into depressive states are dealt with most fully. Social studies, which had been the main concern of the Medical Research Council Unit of which Professor Lewis was for seventeen years Honorary Director, deals with themes of unemployment, environmental adjustment, and ecology. Today it can be read and enjoyed in its historical context.